This article is about the 15th century Korean monarch. For other uses, see Sejong (disambiguation). Sejong was born on 7 May 1397, the third son of King Taejong. When he was twelve, he became Grand Prince Chungnyeong (충녕대군). As a young prince, Sejong excelled in various studies and was favored by King Taejong over his two older brothers. As the third son of Taejong, Sejong's ascension to the throne was unique. Taejong's eldest son, Yangnyeong (양녕대군), was named heir apparent in 1404. However, Yangnyeong's free spirited nature as well as his preference for hunting and leisure activities resulted in his removal from the position of heir apparent in June 1418. Though it is said that Yangnyeong abdicated in favor of his younger brother, there are no definitive records regarding Yangnyeong's removal. Taejong's second son Grand Prince Hyoryeong became a monk upon the elevation of his younger brother Sejong. Following the removal of Yangnyeong as heir apparent, Taejong moved quickly to secure his youngest son's position as heir apparent. The government was purged of officials who disagreed with the removal of Yangnyeong. In August 1418, Taejong abdicated in favour of Sejong. However, even in retirement Taejong continued to influence government policy. Sejong's surprising political skill and creativity did not become apparent until after Taejong's death in 1422. King Sejong revolutionized the Korean government by appointing people from different social classes as civil servants. Furthermore, he performed official government events according to Confucianism, and he encouraged people to behave according to the teachings of Confucianism. As a result, Confucianism became the social norm of Korea at the time. He also published books about Confucianism. At first, he suppressed Buddhism by banning all Buddhist monks from Seoul, drastically reducing the power and wealth of the Buddhist hierarchy, but later he alleviated his action by building temples and accepting Buddhism by making a test to become a monk (Seung-gwa). In 1427, Sejong also ordered a decree against the Huihui (Korean Muslim) community that had had special status and stipends since the Yuan dynasty. The Huihui were forced to abandon their headgear, to close down their "ceremonial hall" (Mosque in the city of Kaesong) and worship like everyone else. No further mention of Muslims exist during the era of the Joseon. In relationship with the Chinese Ming, he made some successful agreements that benefited Korea. In relationship with Jurchen people, he installed 10 military posts, 4 counties and 6 garrisons (hangul: 사군육진 hanja: 四郡六鎭), in the northern part of the Korean Peninsula. He maintained good relations with Japan by opening three ports and allowing trade with them. But he also suppressed Tsukishima island with military forces in order to stop pirating in the South Sea (East China Sea) since Tsushima island was a base for Japanese pirates. King Sejong was an effective military planner. He created various military regulations to strengthen the safety of his kingdom, supported the advancement of Korean military technology, including cannon development. Different kinds of mortars and fire arrows were tested as well as the use of gunpowder. In May 1419, King Sejong, under the advice and guidance of his father Taejong, embarked upon the Gihae Eastern Expedition, the ultimate goal of this military expedition to remove the nuisance of Japanese pirates who had been operating out of Tsushima Island. During the expedition, 245 Japanese were killed, and another 110 were captured in combat, while 180 Korean soldiers were killed. 146 Chinese and 8 Korean kidnapped were liberated by this expedition. In September 1419 a truce was made and the Korean army returned to Korea, but the Treaty of Gyehae was signed in 1443, in which the Daimyo of Tsushima promised to pay tribute to the King of Joseon; in return, the Joseon court rewarded the Sō clan with preferential rights regarding trade between Japan and Korea. In 1433, Sejong sent Kim Jongseo (hangul: 김종서, hanja: 金宗瑞), a prominent general, north to destroy the Jurchens (later known as the Manchus). Kim's military campaign captured several castles, pushed north, and expanded Korean territory, to the Songhua River. 4 counties and 6 garrisons were established to safeguard the people from the Jurchens. A modern reconstruction and scaled down model of Jang Yeong-sil's self-striking water clock. Sejong is credited with great advances in science during his reign. He wanted to help farmers so he decided to create a farmer's handbook. The book—the Nongsa jikseol (hangul: 농사직설, hanja: 農事直說)—contained information about the different farming techniques that he told scientists to gather in different regions of Korea. These techniques were needed in order to maintain the newly adopted methods of intensive, continuous cultivation in Korean agriculture. During his rule, Jang Yeong-sil (hangul: 장영실, hanja: 蔣英實) became known as a prominent inventor. Jang was naturally a creative and smart thinker as a young person. However, Jang was at the bottom of the social class. Sejong noticed Jang's skill and immediately called him to his court in Seoul. Upon giving Jang a government position and funding for his inventions, officials protested, believing a person from the lower classes should not rise to power among nobles. Sejong instead believed Jang merited support because of his ability. 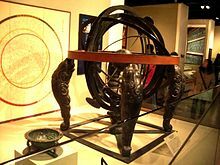 Jang created new significant designs for water clocks, armillary spheres, and sundials. In 1442, Jang made one of the world's first standardized rain gauges named Cheugugi; it was the idea of Munjong, Sejong's son and heir. 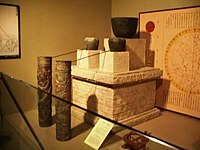 This model has not survived, since the oldest existing East Asian rain gauge is one made in 1770, during the reign period of King Yeongjo. According to the Daily Records of the Royal Secretariat (hangul: 승정원일기, hanja:承政院日記) King Yeongjo wanted to revive the glorious times of King Sejong the Great, and so read chronicles of Sejong's era. When he came across mention of a rain gauge, King Yeongjo ordered a reproduction. Since there is a mark of the Qing Dynasty ruler Qianlong (r. 1735–1796) of China, dated 1770, this Korean-designed rain gauge is sometimes misunderstood as having been imported from China. Sejong also wanted to reform the Korean calendar system, which was at the time based upon the longitude of the Chinese capital. Sejong, for the first time in Korean history, had his astronomers create a calendar with the Joseon capital of Seoul as the primary meridian. This new system allowed Korean astronomers to accurately predict the timing of solar and lunar eclipses. In 1426, Sejong the Great enacted a law that granted government nobi women 100 days of maternity leave after childbirth, which, in 1430, was lengthened by one month before childbirth. In 1434, Sejong also granted the husbands 30 days of paternity leave. In order to provide equality and fairness in taxation for the common people, Sejong the Great issued a royal decree to administer a nationwide public opinion poll regarding a new tax system called Gongbeop in 1430. Over the course of 5 months, the poll surveyed 172,806 people, of which approximately 57% responded with approval for the proposed reform. Sejong depended on the agricultural produce of Joseon's farmers, so he allowed them to pay more or less tax according to fluctuations of economic prosperity or hard times. Because of this, farmers could worry less about tax quotas and work instead at surviving and selling their crops. Once the palace had a significant surplus of food, King Sejong then distributed food to poor peasants or farmers who needed it. In 1429 Nongsa-jikseol (hangul: 농사직설, hanja: 農事直說, "Explanations of Agriculture") was compiled under the supervision of King Sejong. It was the first book about Korean farming, dealing with agricultural subjects such as planting, harvesting, and soil treatment. Although most government officials opposed usage of hangul, lower classes embraced it, became literate, and were able to communicate with one another in writing. Sejong's personal writings are also highly regarded. He composed the famous Yongbi Eocheon Ga ("Songs of Flying Dragons", 1445), Seokbo Sangjeol ("Episodes from the Life of Buddha", July 1447), Worin Cheon-gang Jigok ("Songs of the Moon Shining on a Thousand Rivers", July 1447), and the reference Dongguk Jeong-un ("Dictionary of Proper Sino-Korean Pronunciation", September 1447). In 1420 Sejong established the Hall of Worthies (집현전; 集賢殿; Jiphyeonjeon) at the Gyeongbokgung Palace. It consisted of scholars selected by the king. The Hall participated in various scholarly endeavors, of which the best known may be the compilation of the Hunmin Jeongeum. King Sejong the Great profoundly affected Korean history with his personal creation and introduction of hangul, the native phonetic writing system for the Korean language. Before the creation of Hangul, people in Korea (known as Joseon at the time) primarily wrote using Classical Chinese alongside phonetic writing systems based on Chinese script that predated Hangul by hundreds of years, including idu, hyangchal, gugyeol, and gakpil. However, due to the fundamental differences between the Korean and Chinese languages, and the large number of characters that needed to be learned, there was much difficulty in learning how to write using Chinese characters for the lower classes, who often lacked the privilege of education. To assuage this problem, King Sejong created the unique alphabet known as Hangul to promote literacy among the common people. His intention was to establish a cultural identity for Korea through its unique script. King Sejong created the Korean alphabet (which numbered 28 letters at its introduction, of which four letters have become obsolete), with the explicit goal being that Koreans from all classes would read and write. Each consonant letter is based on a simplified diagram of the patterns made by the human speech organs (the mouth, tongue and teeth) when producing the sound related to the character, while vowels were formed by combinations of dots and lines representing heaven (a circular dot), earth (a horizontal line) and humanity (a vertical line). Morphemes are built by writing the characters in syllabic blocks. The blocks of letters are then strung together linearly. Hangul was completed in 1443 and published in 1446 along with a 33-page manual titled Hunmin Jeong-eum, explaining what the letters are as well as the philosophical theories and motives behind them. The Hunmin Jeong-eum purported that anyone could learn Hangul in a matter of days. People previously unfamiliar with Hangul can typically pronounce Korean script accurately after only a few hours of study. The tomb of Sejong the Great located in Yeoju, Gyeonggi Province, South Korea. Sejong was blinded years later by diabetes complications that eventually took his life in 1450. He was buried at the Yeong Mausoleum (영릉; 英陵). His successor was his first son, Munjong. Sejong judged that his sickly son, Munjong, was unlikely to live long and on his deathbed asked the Hall of Worthies scholars to look after his young grandson, Danjong. As predicted, Munjong died two years after his accession, and political stability enjoyed under Sejong disintegrated when Danjong became the sixth king of Joseon at the age of twelve. Eventually, Sejong's second son, Sejo, usurped the throne from Danjong in 1455. When the six martyred ministers were implicated in a plot to restore Danjong to throne, Sejo abolished the Hall of Worthies, and executed Danjong and several ministers who served during Sejong's reign. The street Sejongno and the Sejong Centre for the Performing Arts, both located in central Seoul, are named after King Sejong. King Sejong is on the Korean 10,000 won bill, along with the various scientific products made under his reign. In early 2007, the Republic of Korea government decided to create a special administrative district from part of the present Chungcheongnam-do Province, near what is presently Daejeon. The district was named Sejong Special Autonomous City. The life of Sejong was depicted in the KBS Korean historical drama King Sejong the Great in 2008. Sejong is also depicted in the 2011 SBS drama Deep Rooted Tree. King Sejong the Great, as depicted on the Bank of Korea's 10,000 won banknote (Series VI). Statue of King Sejong on Gwanghwamun Plaza. Portrayed by Han In Soo in the 1983 MBC TV series 500 Years of Sejong:Tree with deep Roots. Portrayed by Song Jae-ho in the 1998-2000 KBS TV series King and Queen. Portrayed by Kim Sang-kyung in the 2008 KBS2 TV series King Sejong the Great and in the 2016 KBS1 TV series Jang Yeong-sil. Portrayed by Lee Hyun-woo in the 2008 KBS2 TV series King Sejong the Great. Portrayed by Ahn Sung-ki in the 2008 film The Divine Weapon. Portrayed by Jeon Moo-song in the 2011 JTBC TV series Insu, The Queen Mother. Portrayed by Han Suk-kyu, Song Joong-ki and Kang San in the 2011 SBS TV series Deep Rooted Tree. Portrayed by Ju Ji-hoon in the 2012 film I Am the King. Portrayed by Yoon Doo-joon in the 2015 MBC TV series Splash Splash Love. Sejong the Great is one of the six linguistic scholars, with Samuel Johnson, Jacob Grimm, Wilhelm Grimm, Elias Lönnrot, and Vuk Stefanović Karadžić depicted as a portrait in a national currency. A 9.5-meter-high (31 ft) bronze statue of King Sejong was placed in 2009 on a concrete pedestal on the boulevard of Gwanghwamun Square and directly in front of the Sejong Center for the Performing Arts in Seoul. The sculptor was Kim Young-won. The pedestal contains one of several entrances to the 3,200 square meter, underground museum exhibit entitled "The Story of King Sejong". It was dedicated on Hangul Day in celebration of the 563rd anniversary of the invention of the Korean alphabet by King Sejong. Wikimedia Commons has media related to Sejong the Great. ^ a b Yǒng-gyu, Pak (2004). Han'gwǒn ǔro ingnǔn Chosǒn Wangjo sillok (Ch'op'an. ed.). Seoul: Tǔllyǒk. p. 55. ISBN 978-89-7527-029-1. ^ Pratt, Keith (2006). Everlasting Flower: A History of Korea. ^ "Harvard Asia Quarterly - Islam Struggles for a Toehold in Korea". 16 May 2008. Archived from the original on 16 May 2008. ^ "21세기 세종대왕 프로젝트". Sejong.prkorea.com. Retrieved 22 February 2016. ^ "한국역대인물 종합정보 시스템 - 한국학중앙연구원". People.aks.ac.kr. 30 November 2005. Retrieved 22 February 2016. ^ Haralambous, Yannis; Horne, P. Scott (28 November 2007). Fonts & Encodings. "O'Reilly Media, Inc.". p. 155. ISBN 9780596102425. Retrieved 8 October 2016. ^ a b c d e f Kim (1998), 57. ^ "장영실". Bueb125.com.ne.kr. Archived from the original on 18 July 2001. Retrieved 22 February 2016. ^ Strangeways, Ian (2010). "A History of Rain Gauges". Weather. 65 (5): 133–138. doi:10.1002/wea.548. ^ Yi, Pae-yong (2008). Women in Korean History 한국 역사 속의 여성들. Ewha Womans University Press. p. 267. ISBN 9788973007721. Retrieved 18 August 2018. ^ 오기수. "세종대왕의 조세사상과 공법 연구 : 조세법 측면에서". NAVER Academic (in Korean). NAVER Corporation. Retrieved 2 April 2018. ^ "한국 전통과학의 전성기, 세종 시대". YTN사이언스 (in Korean). YTN. Retrieved 2 April 2018. ^ "우리말 배움터". Urimal.cs.pusan.ac.kr. Retrieved 22 February 2016. ^ Korean Spirit and Culture Promotion Project. Fifty Wonders of Korea Volume I: Culture and Art. 2nd ed. Seoul: Samjung Munhwasa, 2009. 28-35. ^ "Tour Guide". Tourguide.vo.kr. Retrieved 22 February 2016. ^ "▒▒ KBS대하드라마 대왕세종 ▒▒". Kbs.co.kr. Retrieved 22 February 2016. ^ "The King Sejong Station - Liquipedia - The StarCraft II Encyclopedia". Wiki.teamliquid.net. Retrieved 22 February 2016. ^ "Language Log » More linguistic numismatics". Languagelog.ldc.upenn.edu. Retrieved 22 February 2016. ^ "King Sejong Statue (세종대왕 동상) | Official Korea Tourism Organization". English.visitkorea.or.kr. Retrieved 22 February 2016. ^ "King Sejong and General Lee Sun-shin to receive modeling fee :: Korea.net : The official website of the Republic of Korea". Korea.net. 9 December 2011. Retrieved 22 February 2016. ^ "King Sejong Story (세종이야기) | Official Korea Tourism Organization". English.visitkorea.or.kr. Retrieved 22 February 2016. ^ "Remembering Hangul". Joongnag Daily. 26 September 2009. Archived from the original on 11 April 2013. Retrieved 27 February 2013. ^ "Statue of King Sejong is unveiled". Joongang Daily. October 10, 2009. Archived from the original on April 11, 2013. Retrieved February 27, 2013. Kim, Yung Sik. (1998). "Problems and Possibilities in the Study of the History of Korean Science," Osiris (2nd series, Volume 13, 1998): 48–79. Kim-Renaud, Young-Key. 2000. Sejong's theory of literacy and writing. Studies in the Linguistic Sciences 30.1:13–46. Gale, James Scarth. History of the Korean People Annotated and introduction by Richard Rutt. Seoul: Royal Asiatic Society, 1972..
King Sejong featured on the 10000 Korean Won banknote. King Sejong the Great: The Everlasting Light of Korea.